The House of Sandeman is celebrating its 225th anniversary with the launch of a special six label collection of Sandeman 2000 Vintage Porto, which celebrates the people, the vision and the stories of Sandeman. Founded in 1790 by the young Scotsman George Sandeman, the business has been handed from father to son in a direct line for seven generations. The descendants of the founder have kept his values alive for over two centuries and today the brand’s rich history serves as an inspiration for this six label collection. 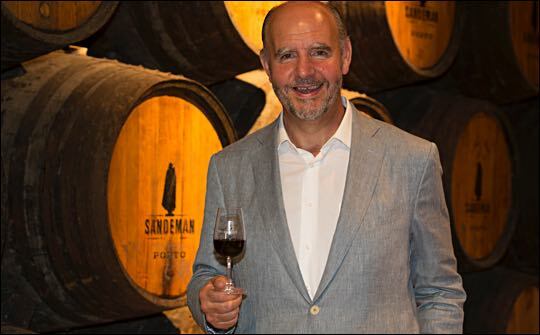 “This is an important moment in our history and it is important to take time to pause and celebrate,” says George Sandeman, seventh generation of The House of Sandeman (pictured below). “After having launched Sandeman Cask 33 earlier this year, a Very Old Tawny Porto that is an authentic representation of Sandeman’s stock of Aged Tawnies, now we want to offer people the opportunity to join us and enjoy our celebration of history with this Sandeman 2000 Vintage Porto”. It all started in 1790, when an ambitious young Scotsman from Perth founded a wine business in London. Commemorating the letter written to his father to request a £300 loan to buy his first wine cellar and start trading in Porto and Sherry, THE WORD is the first label of this collection, reinforcing George Sandeman’s belief that you must always stand by your word. THE SPIRIT stands for the determination and self-confidence of the young founder who quickly became known amongst his peers as a man with a ‘great spirit’ of enterprise, widely respected by people, who would move out of his way to let him pass. George was intelligent and well-informed and his sound business advice was widely sought. He made his fortune in just seven years, but stayed active and ahead of the company until past the age of 70. By then, the company was well established and was shipping wines to all five continents. Recalling the hero who made perilous trips around the world to spread the word on Porto Wine, THE JOURNEY is an homage to the countless miles over land and sea that George Sandeman had to travel to get the brand to where it is today. But because a sip of Porto Wine is a momentous tribute to the many talented workers, winegrowers, winemakers, coopers and tasters who create the perfect experience for us all to enjoy, the 4th label in this collection is THE CRAFT. Sandeman holds centuries of accumulated knowledge and hard labour, and passionate craftsmanship is always the key ingredient. On the other hand, innovation has always been key for Sandeman. The company lays claim to the first use of a signature brand on their casks as a guarantee of origin, clearly identifying their selection of wines and setting them apart from the competition. Trading under the name of George Sandeman & Co, the initials GSC were branded, literally, with a hot iron, onto the company’s wine casks. THE PIONEER evokes therefore the company's first trademark appearing on company documents from the 1840's, and later becoming one of the first to be registered under Trademark Act of 1877. But if many episodes have marked Sandeman’s history and past, the creation of the brand’s global icon – The Sandeman Don – must certainly be remembered. In 1928, Sandeman was well known for commissioning artwork for their poster advertising, which led to a representative of a printing house to approach the firm with a poster by the artist G. Massiot Brown, portraying a mysterious black silhouette on a bright yellow background. Wearing a Spanish caballero’s flat brimmed hat, a Portuguese student's cape, and holding a glass of red Porto Wine. The company acquired the image, which so perfectly captured the spirit of Sandeman, for an advertising initiative. The distinctive silhouette has underpinned all Sandeman's advertising initiatives since then. In 1935, a stroke of genius led the figure to be placed on the label of a Tawny Porto named Dry Don thereby gaining the name of The Sandeman Don, and becoming one of the first logos ever created to be registered as a trademark in 130 countries. To this day, the man in THE HAT & CAPE is identified throughout the world, not only as the symbol for the wines of Sandeman, but also for Porto Wine. There are 225 complete collections that celebrate these six key moments in Sandeman’s entrepreneurial and inspirational history. Available in wooden cases each containing a commemorative anniversary book, as well as limited edition single bottles in 75cl, 150cl and 300cl, the collection starts at £70 and will be available from mid-November at the St. Swithins Lane Wine shippers, Vin Neuf Wine Merchant, Slurp online store and S. H. Jones Wines.